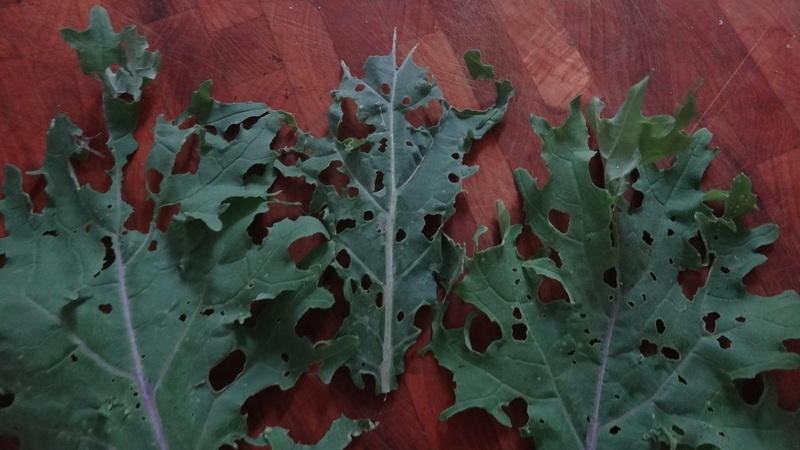 There are three primary reasons why I haven’t launched aggressive war on the cabbage butterfly (Pieris rapae) caterpillars munching on the cruciferous veggies in my garden, even though I don’t like them: (1) garden neglect; (2) hostility towards most pesticides; and (3) bonhomie toward caterpillars by my toddler. There is also a fourth reason. I know that in general most plants increase production of chemical defense compounds when they detect that they’re being attacked by pathogens or herbivores (Textor and Gershenzon 2009). Some of these defense compounds have been shown to be beneficial for human health, including those in crucifers. I’ve been wondering for a while if those caterpillars were actually enhancing the value of the tissue they didn’t consume. A recent report about a high-defense-compound laden variety of broccoli prompted me to do some research into the issue. I’m left with more questions than answers. You’ve all heard that broccoli and other cruciferous vegetables (family Brassicaceae, order Brassicales) are “good for you.” They’ve got the usual green vegetable nutrients and fiber, but they’re also loaded with glucosinolates. Glucosinolates are one of many types of defense compounds plants deploy, crucifers most spectacularly, to deter pathogens and herbivores. Cruciferous plants store their glucosinolates in either specialized storage cells near the phloem (Koroleva et al. 2000) or in special vacuoles (storage compartments) within cells (Textor and Gershenzon 2009). When the plant is damaged, like when an herbivore bites it, the glucosinolate storage cells break, and the glucosinolates spill out and come into contact with enzymes (myrosinases) that rapidly convert them into different compounds (“hydrolysis products”). Bacterial enzymes in an animal gut can also perform this conversion, even if the vegetable has been cooked (Traka et al. 2013). These hydrolysis products are the actual defense compounds, not the glucosinolates themselves. Collectively the many species in the Brassicales produce over 120 different glucosinolates, and the hydrolysis products of some of them are the pungent, sharply spicy mustard oils characteristic of the family (Bekaert et al. 2012). While the glucosinolate-myrosinase “mustard bomb” is extraordinarily effective against many herbivores and pathogens, some have devised ways of circumventing the toxicity of the compound. Hence the cabbage butterflies in the garden. They feed exclusively on crucifers, and for them, mustard oil is an attractant, not a repellent (Textor and Gershenzon 2009). Every organ in cruciferous plants—leaves, roots, flowers, fruit, seeds—has the glucosinolate-myrosinase defense system. My toddler. 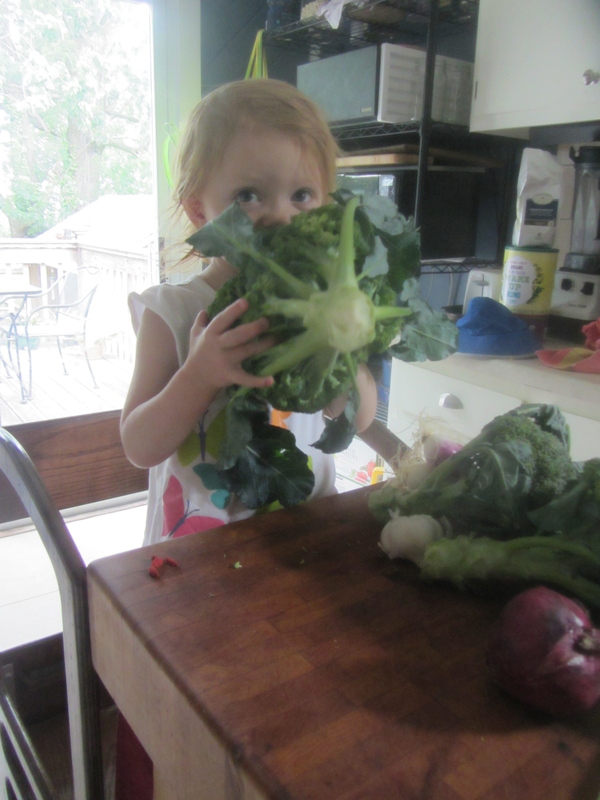 Sampling the broccoli. In people, the hydrolysis products, especially isothiocyanates, contribute to demonstrable cardiovascular and cancer risk reduction benefits of a diet high in crucifers (references in Traka et al. 2013). High crucifer consumption is also linked with hypothyroidism and anemia (Stoewsand 1995), albeit somewhat controversially (Edmands et al. 2013). Different glucosinolate derivatives and other defense compounds in crucifers seem to have divergent or multiple effects on human health. It was with the anti-cancer and cardiovascular benefits in mind, though, that a team of plant scientists recently developed three high-glucosinolate cultivars of broccoli, two of which they trademarked as Beneforté® broccoli (Traka et al. 2013). Beneforté broccoli contains 2.5-3 times as much of the glucosinolate glucoraphanin (technically 4-methylsulphinylbutyl glucosinolate) as standard broccoli (Traka et al. 2013). Some cruciferous species produce many different glucosinolates, some only produce a few (Mithen et al. 1987). Most species have a dominant glucosinolate, though (Mithen et al. 1987). Of all the B. oleracea vegetable varieties, broccoli is the only one with dominant glucoraphanin. Unlike the mustard oils and other hydrolysis products, however, the hydrolysis product of glucoraphanin is mostly flavorless and has high anti-cancer activity (Faulkner et al. 1998), implying that increasing its levels in broccoli might make the broccoli more nutritious without affecting its flavor. To clarify, some of the strongly-flavored mustard oils do have anti-cancer properties, but tinkering with their concentration would affect flavor, for good or ill. The exemplary chemical profile in Beneforté was achieved with good old-fashioned plant breeding. The plant scientists observed that like most modern cultivated plants, domesticated broccoli had much lower concentrations of defense compounds (in this case glucosinolates) than its wild relatives (Mithen et al. 1987, Faulkner et al. 1998). They hypothesized that hybridizing modern broccoli (Brassica oleracea var italica) with its wild, weedy Mediterranean relatives (Brassica oleracea var villosa) could re-introduce the genes for high constituent (baseline) glucosinolate levels into cultivated broccoli (Traka et al. 2013). They were right. The first step in the path to Beneforté was a sweet Sicilian vacation to collect the wild broccoli relatives to perform the cross. Well, I don’t know that, but I hope it happened. Somebody at some point got some seeds from Sicily. You know that many of our distinctive cultivated crucifers are varieties of B. oleracea. It is almost certain that the different vegetables originated from different, distinct wild populations of B. oleracea throughout its wide Eurasian range. Part of this history has been worked out by matching the highly variable glucosinolate profiles of B. oleracea cultivars (Kushad et al. 1999) with those of wild populations (Mithen et al. 1987). Wild B. oleracea is a morphologically and genetically variable consortium of populations. The most distinct groups are sometimes labeled as separate species (11 of them, in fact; Mithen et al. 1987). Taxonomists go back and forth with these grey-zone decisions about where to draw species lines. Either way, it is safe to simply call the diverse wild set (all mostly interfertile with 9 sets of chromosomes) the “Brassica oleracea group.” B. villosa, the likely ancestor of broccoli, is in the B. oleracea group, and is rare and endemic to (only occurs on) the limestone cliffs of western Sicily. The evidence that B. villosa is the ancestral broccoli is that of all the wild and cultivated members of the B. oleracea group, only wild B. villosa and broccoli have a particular mutation that inhibits function of gene GSL-ALK and allows their dominant, closely-related glucosinolates (glucoraphanin and glucoiberin) to accumulate (Faulkner et al. 1998). The other B. oleracea veggies produce some glucoraphanin and glucoiberin, but their functional GSL-ALK gene allows them to convert glucoraphanin and glucoiberin into other glucosinolates that are less desirable from a human health perspective (Faulkner et al. 1998). In an email, one of the lead scientists of the Beneforté effort, Richard Mithen, explained that B. villosa itself does not produce glucoraphanin but does make very high levels of very similar glucoiberin (3-Methylsulphinylpropyl glucosinolate) but not much else. The high level of glucoraphanin in Beneforté results from biochemical synergism of the parental glucosinolate patterns. 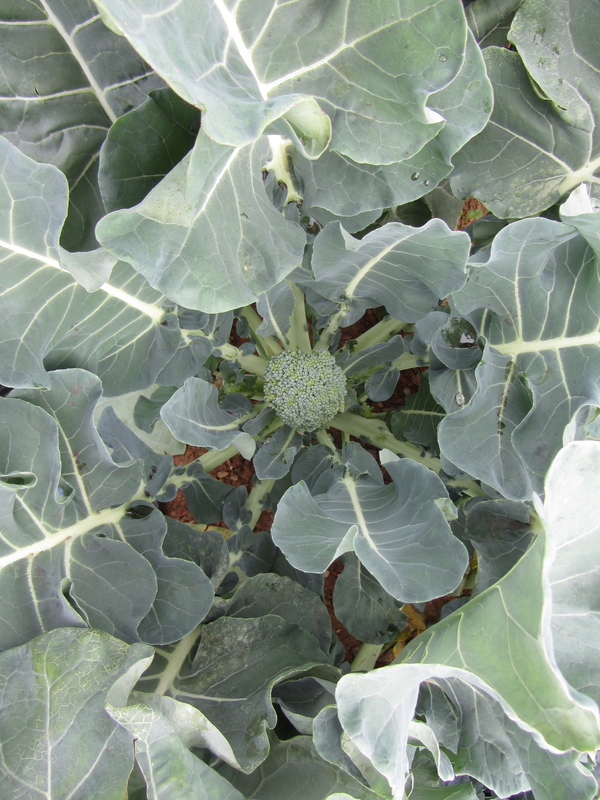 Crossing broccoli with other wild B. oleracea varieties, said Dr. Mithen, produced F1 hybrids with elevated but undesirable glucosinolate profiles. Back in the greenhouse, the first generation (F1) hybrids of standard broccoli and wild B. villosa, said Dr. Mithen, were leafy and had very small inflorescences, definitely not good candidates for making an Enchanted Broccoli Forest. Dr. Mithen, said that after the initial F1 was made, they had to successively backcross the F1 with standard broccoli about ten times in order to recover the large inflorescence and other agronomic characteristics of standard broccoli. All of you gardeners and farmers know that broccoli is not a particularly fast-growing vegetable, so shepherding at least 11 generations took time. The F1 was produced in 1994, and Beneforté was released in 2011. If you want to grow cruciferous vegetables, especially Beneforté, ensure that your soil has adequate levels of sulfate. Crucifers have what you might call a high-sulfur lifestyle. Glucosinolates are rich in sulfur, as are several other important abundant compounds in crucifers, including amino acids cysteine and methionine, antioxidant glutathione, and defense compound phytoalexin S-methyl cysteine sulfoxide (SMCSO). SMCSO and glucosinolates combined can account for as much as 5-6% of Brassica vegetable dry weight (Edmands et al. 2013). SMCSO, incidentally, is thermally degraded during cooking into sulfurous volatiles that can stink up your house or lend an unpleasant flavor to long-cooked cruciferous veggies (see details in Harold McGee’s indispensible On Food and Cooking). Beneforté plants take up more total sulfate (sulfur source) from the soil than standard broccoli plants and allocate more of their sulfur to glucoraphanin at the expense of other sulfurous compounds (Traka et al. 2013). So Beneforté is proportionately less potentially stinky for a given level of health benefit than standard broccoli, if that matters to you. I wondered if the industrious caterpillars in my garden could increase beneficial glucosinolates in broccoli to Beneforté constituent levels. Unfortunately, there is a huge lack of information about effects of herbivory on induced glucosinolate levels in cultivated Brassica oleracea varietals, but what I could find is inconsistent. Crucifer species and even populations of individual species vary considerably in the responses of their particular glucosinolate cocktail to herbivory. Glucosinolates are derived from different amino acids, forming three broad classes: indolic, aliphatic, and aromatic glucosinolates. Each class seems to have a different induced reponse to herbivory (Textor and Gershenzon 2009). Glucoraphanin is an aliphatic glucosinolate, derived from amino acid methionine (Traka et al. 2013). Herbivory induces the strongest increase in indolic glucosinolates, from 1.2- to 20-fold (Textor and Gershenzon 2009). Aliphatic and aromatic glucosinolate concentration regularly increases 1.2- to 3-fold in response to herbivory, but sometimes their concentration actually declines (Textor and Gershenzon 2009). I don’t know that much about the human health effects of indolic glucosinolate derivatives, and it appears that much of the potential human health impact of herbivory in crucifers depends on that. And I didn’t even start to research constituent or induced glucosinolate levels in crucifer species other than Brassica oleracea. I know that arugula, for example, also in the garden and targeted by caterpillars, has glucoraphanin (Faulkner et al. 1998). 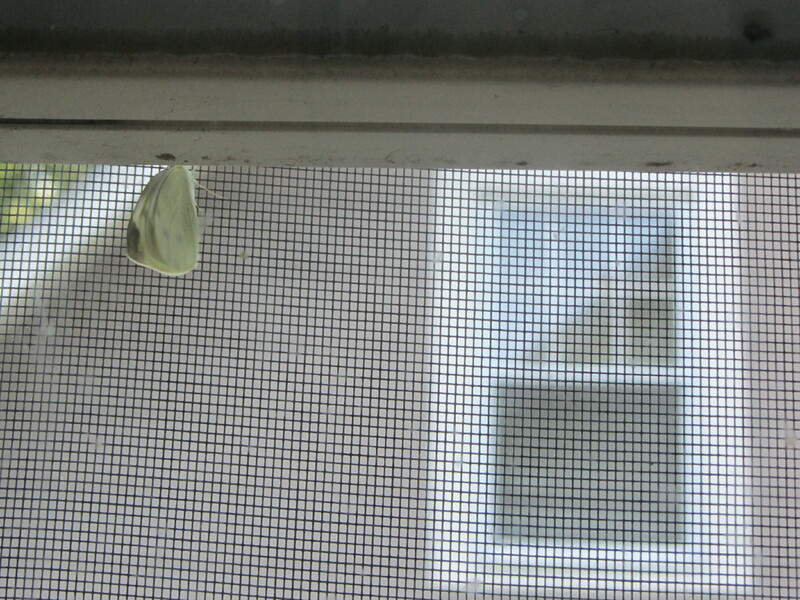 I recently watched a fluttering female cabbage butterfly presumably happily lay half a dozen eggs on my kale in the time it took me to read The Very Hungry Caterpillar to my toddler within view of the garden (we have that book memorized, so I can watch the garden and “read” at the same time). 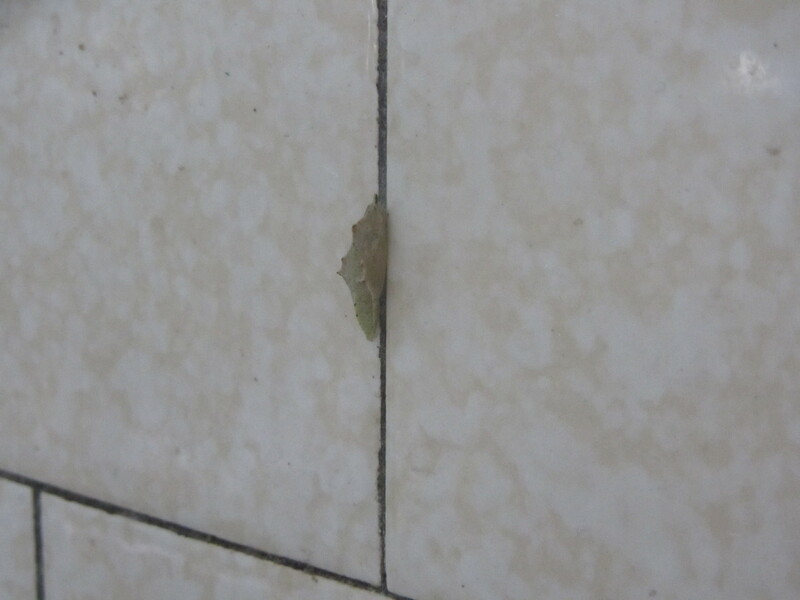 I plucked those leaves and scraped the eggs off before the caterpillars had a chance to hatch. I certainly haven’t been so quick with much of the rest of the garden crucifers. I wish I could find out more about the glucosinolate effects of that herbivory. Maybe we’ll try growing some Beneforté seeds next year. I’ll think of my mother when I harvest and wash the broccoli, only to inevitably find to my horror, as she did, that caterpillars hiding in the broccoli jump ship and float in the water in the sink. And I’ll toast Sicily when we get over our horror and drown that superpowered broccoli in some variant of classic Italian bagna cauda sauce. Chef friend of the blog Michelle Fuerst’s take on a simple version of the wondrous stuff is below. Brown butter and anchovy sauce makes almost anything taste better. The slightly salty and nutty flavor of the toasted butte and richness of the anchovy is a perfect counterpoint for vegetables both bitter and sweet. From summer’s green beans to spring’s asparagus, this sauce will taste delicious on anything and the anchovies pack some delicious Omega 3’s to boot. Cut 1 large head of washed broccoli into 2 inch florets. Make sure to peel the stalk and cut it into small chunks. It is so sweet and tender under that thick, tough skin! Over high heat, bring an inch of water to a boil in the bottom of a pot into which your steamer basket fits. Put florets in the basket, cover, and steam until tender, about 8 minutes for fully tender florets. Drain well, set aside and keep warm. In a large sauté pan, melt 4 tablespoons of butter over medium heat. When butter begins to foam, add 6 oil packed anchovies, which have been rinsed and dried. With the back of a wooden spoon or fork, mash up anchovies. Continue to cook until the milk solids have turned golden brown and anchovies have melted into the sauce. Add broccoli to pan and toss to coat. Taste and adjust seasoning. A special thanks to Dr. Richard Mithen, who patiently answered my questions about Beneforté. Agrawal, A. A. and N. S. Kurashige. 2003. A role for isothiocyanates in plant resistance against the specialist herbivore Pieris rapae. Journal of Chemical Ecology 29:1403-1415. Bekaert, M., P. P. Edger, C. M. Hudson, J. C. Pires, and G. C. Conant. 2012. Metabolic and evolutionary costs of herbivory defense: systems biology of glucosinolate synthesis. New Phytologist 196:596-605. Edmands, W. M. B., N. J. Gooderham, E. Holmes, and S. C. Mitchell. 2013. S-Methyl-L-cysteine sulphoxide: the Cinderella phytochemical? Toxicology Research 2:11-22. Faulkner, K., R. Mithen, and G. Williamson. 1998. Selective increase of the potential anticarcinogen 4-methylsulphinylbutyl glucosinolate in broccoli. Carcinogenesis 19:605-609. Gols, R., R. Wagenaar, T. Bukovinszky, N. M. van Dam, M. Dicke, J. M. Bullock, and J. A. Harvey. 2008. Genetic variation in defense chemistry in wild cabbages affects herbivores and their endoparasitoids. Ecology 89:1616-1626. Koroleva, O. A., A. Davies, R. Deeken, M. R. Thorpe, A. D. Tomos, and R. Hedrich. 2000. Identification of a new glucosinolate-rich cell type in Arabidopsis flower stalk. Plant Physiology 124:599-608. Kushad, M. M., A. F. Brown, A. C. Kurilich, J. A. Juvik, B. P. Klein, M. A. Wallig, and E. H. Jeffery. 1999. Variation of glucosinolates in vegetable crops of Brassica oleracea. Journal of Agricultural and Food Chemistry 47:1541-1548. Mithen, R. F., B. G. Lewis, R. K. Heaney, and G. R. Fenwick. 1987. Glucosinolates of Wild and Cultivated Brassica Species. Phytochemistry 26:1969-1973. Pierre, P. S., S. Dugravot, A. M. Cortesero, D. Poinsot, C. E. Raaijmakers, H. M. Hassan, and N. M. van Dam. 2012. Broccoli and turnip plants display contrasting responses to belowground induction by Delia radicum infestation and phytohormone applications. Phytochemistry 73:42-50. Stoewsand, G. S. 1995. Bioactive Organosulfur Phytochemicals in Brassica-Oleracea Vegetables – a Review. Food and Chemical Toxicology 33:537-543. Stowe, K. A. and R. J. Marquis. 2011. Costs of defense: correlated responses to divergent selection for foliar glucosinolate content in Brassica rapa. Evolutionary Ecology 25:763-775. Textor, S. and J. Gershenzon. 2009. Herbivore induction of the glucosinolate-myrosinase defense system: major trends, biochemical bases and ecological significance. Phytochemistry Reviews 8:149-170. Traka, M. H., S. Saha, S. Huseby, S. Kopriva, P. G. Walley, G. C. Barker, J. Moore, G. Mero, F. van den Bosch, H. Constant, L. Kelly, H. Schepers, S. Boddupalli, and R. F. Mithen. 2013. Genetic regulation of glucoraphanin accumulation in Beneforte (R) broccoli. New Phytologist 198:1085-1095. Verkerk, R., M. Dekker, and W. M. F. Jongen. 2001. Post-harvest increase of indolyl glucosinolates in response to chopping and storage of Brassica vegetables. Journal of the Science of Food and Agriculture 81:953-958. This entry was posted in Recipes, Uncategorized, Vegetables and tagged Beneforte, Brassica, Brassicaceae, Brassicales, broccoli, glucosinolate, human health, induced defense, Jeanne L. D. Osnas, Pieris rapae, recipe, secondary metabolite. Bookmark the permalink. Well, when the bun-buns strip all your broccoli to the stems, it really doesn’t matter about the cabbage butterfly larvae now does it? Oh, no it doesn’t. Knock on wood…..